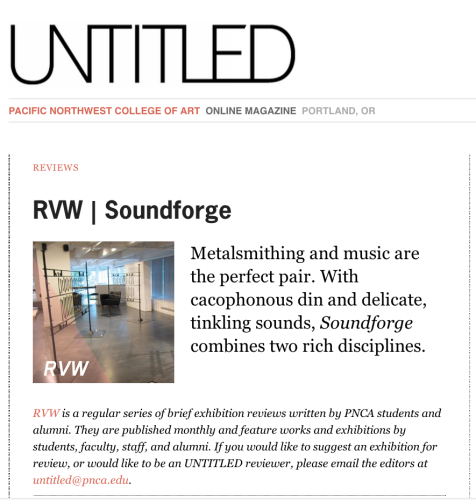 My first article for PNCA’s online Untitled Magazine is available! Happy birthday to me! It’s about a great audio installation at Portland Museum of Contemporary Craft. Click the screenshot below to read the article. Gabriel Craig has a deep interest in spreading the “gospel of craft.” Several of his projects have centered around sharing the empowering feeling of working with your hands. He’s held workshops on copper bowl making and taken to the streets to share the craft of jewelry making as a means of encapsulating memory. He wants to break the craft object out of its fetishized, consumerist box and unleash its full potential as a bartering tool, community strengthener, and confidence builder. In his eyes, anyone can become a master craftsperson and everyone should.